MMS FEBRUARY 2018 64 mmsonline.com MEDICAL MANUFACTURING Effective masking ensures the PVD coating is applied only where it is required. chromium, zirconium, aluminum and various other alloys, are reacted with a gas (usually nitrogen and/or a carbon-containing gas) to form a coating material that condenses on the parts to be coated. 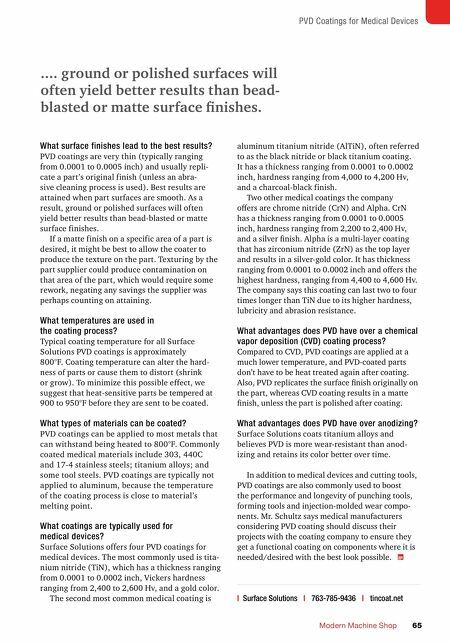 Cathodic-arc PVD produces high levels of metal ionization (more than 95 percent), which helps ensure high coating adhesion to the substrate mate- rial. The process typically has wide operating windows, making it possible to deposit quality coatings using a variety of process parameters. Other coating processes, such as sputtering or ion plating, are not as robust and have smaller operating windows, making it more difficult for them to consistently produce a quality coating. What prep work is necessary prior to coating? To achieve a well-adhered coating, it is very important that the parts to be coated are clean. Part surfaces must be free of oxides, EDM recast and organic films, because such contaminants can adversely affect coating quality. To remove contaminants before coating, coating companies use tech- niques such as polishing, tumbling, acid etching, and sand and glass-bead blasting. Some of these techniques can alter the surface finish of the part being coated, however, so the coating company often works with the customer to develop a process that meets the customer's expectations for coating quality and part appearance. Are sharp edges adversely affected by the coating process? If a part has sharp edges, cleaning processes that could adversely affect edge sharpness would not be used. Additionally, if tiny or ver y fragile parts are being coated, coating- process modifications can be made to reduce heat-up and coating rates. These modifications ensure that deli- cate features are not overheated and the coating is not too thick. 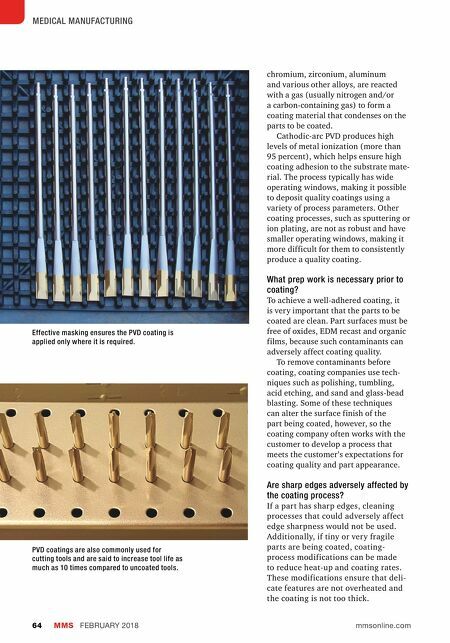 PVD coatings are also commonly used for cutting tools and are said to increase tool life as much as 10 times compared to uncoated tools.